Most precious metals futures finished lower Thursday. Gold was the exception, registering its third gain in four sessions. Gold for December delivery rose $2.70, or 0.2%, to settle at $1,230.10 an ounce on the Comex division of the New York Mercantile Exchange. "Given equity weakness, gold looks increasingly attractive as a defensive hedge," MarketWatch quoted Stephen Innes, Asia-Pacific head of trading at Oanda, in an email update. "But with the [dollar] refusing to stay down for the count, markets could be torn between competing narratives over the near term, weaker equities vs. the stronger USD." 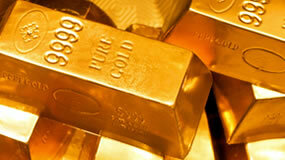 Gold futures ranged from a low of $1,221.70 to a high of $1,233.60. They shed 0.3% on Wednesday, edged up less than 0.1% on Tuesday — closing at their highest price since July 31, and they moved up 0.7% on Monday. Ending down for a third day in a row, silver for December declined 5.9 cents, or 0.4%, to $14.604 an ounce. Silver futures traded between $14.47 and $14.68. They lost 0.3% on Wednesday, declined 0.2% on Tuesday, and rose 0.6% on Monday for their best settlement since Aug. 28. January platinum fell $8.90, or 1.1%, to $831.70 an ounce, ranging from $828.60 to $837.30. Palladium for December delivery lost $2.90, or 0.3% to $1,064.70 an ounce, trading between $1,057.50 and $1,070.60. Gold declined $6.05, or 0.5%, to 1,223 an ounce. Silver fell 13.5 cents, or 0.9%, to $14.515 an ounce.